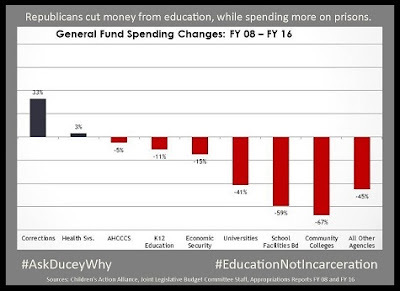 Since fiscal year 2008, Republicans in the Arizona Legislature have shifted state funding away from education and toward the Department of Corrections, which oversees the operations of for-profit, private prisons. A recent analysis by Children’s Action Alliance showed that spending for K-12 education, community colleges, and universities has been on a plummeting trajectory since 2008. During the same time frame, state spending on corrections has jumped by 33 percent. This trend is, in part, the result of misguided Republican priorities. Republican leaders continue to invest in private prisons, which may not be saving the state money, while divesting from public education. This seems to indicate they are playing favorites with private prisons. These choices look like they are already affecting the state’s economy. Arizona’s job market is the third worst in the country. Recently, the state’s unemployment rate increased to 6.1 percent, while national unemployment remained at 5.3 percent. #AskDuceyWhy he and other Republicans in Arizona are prioritizing for-profit, private prisons over our schools. #EducationNotIncarceration.